It’s that time of year again, where it’s normal to embrace the ghouls, ghosts, and goblins that come to your door. Your front yard is decorated with cobwebs and gravestones, giving welcomed participants a trick. But, what will you prepare as a treat for Halloween? How about you transform your Jack-o-lantern into a pumpkin treat, with multiple benefits for your health? The pumpkin that’s sitting on your porch, carved to entertain and trick trick-or-treaters, is actually a healthy treat itself. That soft orange pumpkin, confined within that hard outer shell, provides you with many beneficial vitamins, minerals, electrolytes, and phytonutrients, such as vitamin A, copper, potassium, and carotene. Those are just a few of the many benefits of pumpkin. What about those seeds in the middle? There are tons of benefits of pumpkin seeds. Pumpkin seeds have a low amount of calories, and are a good source of zinc, manganese, tryptophan, magnesium, phosphorus, copper, protein, and iron. Pumpkin pie is the most common use of pumpkin, although there are also many soup, dip, sauce, and alternative dessert pumpkin recipes available online. It’s always tempting to use canned pumpkin purée for your recipe, though use your whole pumpkin at this time of year when they are readily available. One of the greatest health benefits of pumpkins is that they’re filled with antioxidants. The antioxidant beta carotene within pumpkin helps you prevent coronary heart disease. 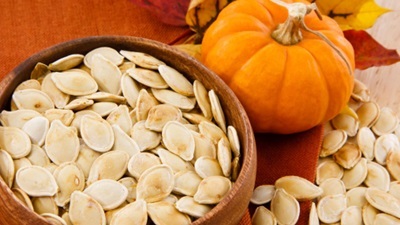 Pumpkin seeds always make for a great snack around Halloween, and they are good for your heart as well. Studies have shown that the plant-based chemical phytosterol in pumpkin seeds reduces low-density lipoprotein (LDL), known as “bad” cholesterol, another one of the health benefits of pumpkins. Also, with only a 1/4 cup of pumpkin seeds, you receive about half of the daily recommended amount of magnesium, which helps pump your heart. Reap the health benefits of pumpkins by eating these healthy foods year round. Add cancer-killer to the list of health benefits of pumpkins. The beta carotene and vitamin K within pumpkin is also great in preventing various forms of cancer, according to the National Cancer Institute. The carotenoid beta-cryptoxanthin could help smokers decrease the risk of lung cancer. Eating pumpkin seeds, a great item to add to your list of healthy foods, is also known to decrease the risk of breast and prostate cancer. Talk about the great health benefits of pumpkin seeds! Beta carotene, and possibly vitamin C, helps pumpkin strengthen your immune system. Also, the zinc within pumpkin seeds is great for your immunity, so these are healthy foods that can be especially beneficial to boost your immune system in the winter. If you are sick and get the flu frequently, and experience chronic fatigue, you are likely deficient in zinc. Want to never get sick? Then reap the benefits of pumpkin seeds, and add pumpkins to your list of healthy foods. Can one of the health benefits of pumpkin be improving vision? When beta carotene is converted into vitamin A in your body, it is essential for eye health. Every 100 grams of pumpkin contain 7,384 IU of vitamin A, which is 200% more than your recommended daily allowance—talk about a reason to eat these healthy foods. When you eat pumpkin seeds, you’re likely won’t be too frightened when kids come to the door in scary costumes. These seeds contain the amino acid tryptophan, which will help you relax, lighten your mood, and help you sleep. Tryptophan is important in producing serotonin—instrumental to your mood. So if you don’t want to feel blue this year, try adding pumpkins to your healthy foods diet. Linus van Pelt, of the famed Peanuts’ Charlie Brown TV series, spent his Halloween stubbornly waiting to see the Great Pumpkin, within a pumpkin patch. If the grade-school student just ate one of the pumpkins that surrounded him, he ironically would have been in a better mood. Pumpkins are most popular around Halloween, but your healthy foods diet is not complete without adding pumpkins to it all year long. Don’t miss out on the benefits of pumpkins and the benefits of pumpkin seeds and add them to your diet, or all you’re doing is scaring away good health! Mercola, J., “9 Health Benefits of Pumpkin Seeds,” Mercola.com web site, September 30, 2013; http://articles.mercola.com/sites/articles/archive/2013/09/30/pumpkin-seed-benefits.aspx.